Riding a bike is good for working on problems, or puzzles. This was printed inside the cap of my HonestTea. We were sitting at a picnic table in the sun at the Whoa Nellie Deli. The best lunch in Lee Vining can be found at the Mobil station. Deb read it and said "WHAT does THAT mean?" A lot of skepticism there. Drew said nothing. It is sort of a Taoist idea, a thing and its opposite can't exist without each other. Kinda out of place here in the middle of the Wild West. 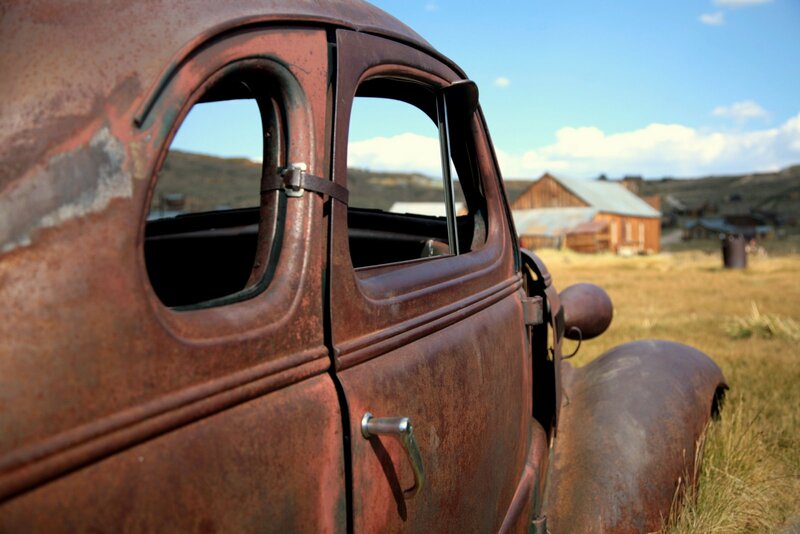 Bodie, a famous ghost town, is 15 miles that-a-way. Bodie was a classic boom town, gold and silver. It was huge, then in the blink of an eye it was nothing Now people go to gaze at the ruin. They go now to connect with something. Their own mortality? The past? Don't know what. It's a kind of fantastical realism on display. This is what happens when you just follow your nose. People who do events like 1200K bike rides and the Eastern Sierra Double Century, we tend to view ourselves as realists. We're pragmatic, down-to-earth, sometimes cynical. Here we are. Stuff will happen. If something happens, better fix it. Do the project anyway. On the other hand it takes a fair amount of heart and soul and whatever to put yourself in these situations and persevere. I thought of Michaelangelo, who did a bunch of stuff that was both pragmatic and beautiful. While painting the ceiling of the Sistine Chapel he supported his entire family. Among other things he was a sculptor. What is it like, to look at an ugly block of marble and see the soft, living thing it needs to become? You can't take crushed rock and reassemble it into the Pieta. But if you begin with a vision of something to create with your life energy, you can work at it and make it real. Lately I've been spending so much time packing and traveling and riding my bike that it feels like I'm avoiding working on whatever comes next. Could be time to get going on that.